BTW - especially LOVE that whomping willow on the back heel! Gotgrey here's a photo of the mushroom with the sand and pencils, they could also be used seperate! Thank you Ninaprettyballerina for all your time and energy invested in my gifts. I hope you like yours as much as I love mine. This has been a creatively challenging swap and I have enjoyed it completely, (despite stressing, undoiung, redoing etc ). Thank you Cabinarts for organising this swap. I am WAY behind in posting pics and SO sorry - we've been on our annual cabin trip and in the past there was internet connection (though I tell everyone there isn't) but this year they're apparently run by a different company and no internet! Now we're at the in-laws where we DO have WIFI (thank God, I've been in serious withdrawal!) so in a bit I will make sure to upload photos - I've opened everything up until day 12 and my stuff from onyxnox is AWESOME!!! As you can see all of my presents were wrapped up sooo beautifully and each one completely different, such a joy to open each one. I'm still getting my house in order after the days festivities so my photos will be a little out of order. Sorry Spidermom I know you were super organised. What's in this amazing package? Only my very own mini glitter house scene! !, made in a matchbox, it is tiny, and sparkly oh and it hangs on the tree, behold the cuteness. As I lay on the couch with the start of a sinus infection, my night is just a bit better because I have this fabulous sweater that amazing_784 knitted for me I have to get a better picture of the birds but they have been loved well tonight; it's great when my son can share with his cousins of all ages. The gallery is so incredible, with so much art work of trees, trailers, villains, flowers and more that I know I'm missing... Loads of knitted and crochet items.... Angels, tardis, bird, WOW! Merry Christmas to all, and to all a good night....er...well...good morning, um, afternoon... Good rest of the week! I delayed opening my last pressies... the black out and bad weather was getting to me when our generator blew a gasket, and then the small generator we had just was not cutting it, as it was cutting in and out with the cold weather (and it may have blown a gasket too), so my mood was less than merry. However, we went out to family yesterday and that cheered me up, and we came home to LIGHT!!!! Hydro finally got around to working on our lines and got our power back up during Christmas day - thank goodness. Our neighbours pulled in to their driveway at the same time we did and it just was a little hugfest as we all celebrated the joy of LIGHT, and HEAT, and POWER!!!! So I am in a much better mood now. I did not think I would give the last days of the wonderful package rockmygypsysoul sent me justice, while I was in the low mood. ... and finally, my first sweet little man, Toby. I love these so, so, so very much! ... that would be gift enough, but she went over the top and sent me the hand carved lino block that made that print! It must have taken forever to carve it - look it all the detail! SOCKS - love socks! Especially cute, colourful, fun socks! Crafty goodies - a small box of metal bits, perfect for stamping, a PMC kit - perfect as I was just working with PMC before my power went out, and a sweet White Rabbit cameo - so cute. ... and last but not least... I could not believe this was an "extra" - another carved stamp of pine cones on a bough. I think this is wonderful and am already thinking of how I can use it to make more tags and maybe next years Christmas cards. Thank you JoAnn, I loved all aspects of your package, and thank you for the hard work, thoughtfulness, and creativity you imbued into it. Thank you for the wonderful gifts and being a great swap partner! 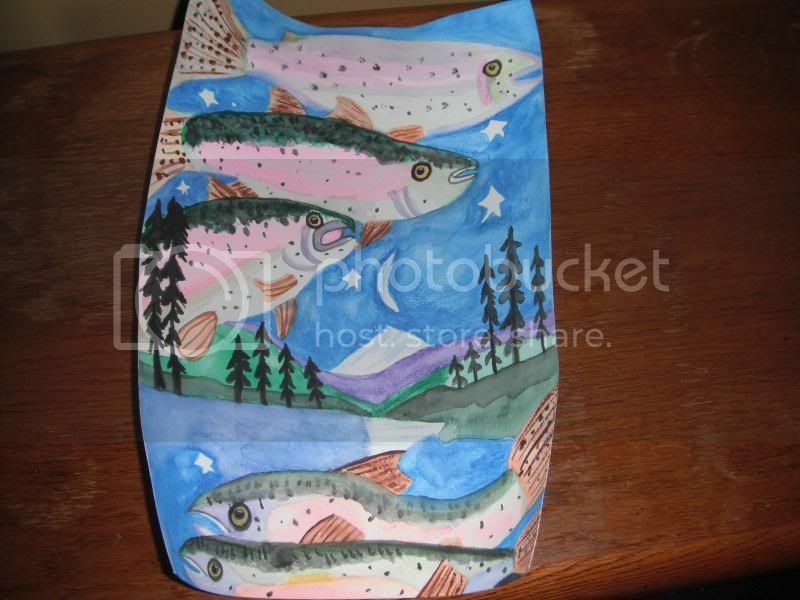 quaggy, here is a pic of the rainbow trout watercolor I painted for you.